A couple of nights ago, I dreamt I was with Dear Hubby, my father-in-law Daddy Henry and a little baby! We wanted to go for a walk and we meandered by a river. After some time, we reached a door in the forest. Dear Hubby took out the door (yeah he didn't open it, he just grabbed it by the sides and pulled it out and set it aside), and next thing we knew, we were magically transported to a busy street market. I told them I needed shoes before we could go any further. I was barefoot and I didn't want to walk through the market and get my feet dirty (as if it wasn't dirty enough from all that walking! Hahaha!). Luckily, I saw a lady selling slippers on the street. I slipped into a pair but discovered I didn't have any cash on me! To my relief, she said I could leave my cellphone charger (why would I bring a cellphone charger and not my wallet?!) with her and just pay for the slippers and pick up my cellphone charger when I was ready! So we happily walked around the street market and I was surprised to see my friend Nina was there as well! She was standing on a bridge lined with cobblestones, surrounded by balloons and musicians, on the opposite side of the river so I waved hello and motioned for her to meet me on my side! She wouldn't budge though and told me to come and meet her instead! I was kind of upset that I had to walk across the bridge and leave DH, FIL and baby on their own. Nina and I then went inside a Fort Santiago like dungeon and she told me to get anything I want. "Anything I want of what?" I asked, the dungeon like setting creeping me out a bit. Then she pointed out the Ladurée pastries and macaroons laid out in front of us! In a flash, the dungeon lit up! That's when I realized we were in Paris! So we happily munched on cakes and macaroons and I told her I was glad I met her on her side of the river! Hehehe! Suddenly we were back in our house and I worriedly told DH I forgot to pay the slippers lady and that my cellphone charger was still with her! Before I could panic any further, I woke up! First thing that popped into my head was "Thank goodness I don't owe the slippers lady any money!" I actually even felt relieved that my cellphone charger was safe at home with me, hahaha! But dreaming of Paris definitely put me in a good mood. The dream was so vivid and it felt so real. I tried to analyze what my dream meant and I figured it meant only good things right? Maybe something to do with food, culture or fashion because what else does a winding river, Ladurée, and cobblestoned street markets in Paris mean right? Something close as it turned out! That weekend, I was invited to to go to the Brooklyn flea market by a lady who owns a showroom downtown, and very much a fashion industry insider! She wanted to look for antiques, and visit a friend of hers who had a booth there. So we went over to her friend, who was busily piling several pairs of barely used Giuseppe Zanotti heels and sandals, all at about $50-$70 a pair. We were wondering why she wanted to get rid of all her shoes, and apparently, she had just started with Miu Miu and well, office policy requires that they wear Miu Miu shoes exclusively! (Hmmm, that's an office policy I wouldn't exactly be forced to comply with, hahaha!) Minutes later, a lady was stuffing several pairs of her shoes into a Birkin bag! She practically bought the whole lot to resell in her high-end used goods/consignment shop somewhere in the city! Not a very common experience right? A few days after, with the help RZ, I found myself making arrangements to go backstage to a show for S/S 09 Fashion Week this September! My new buddy Samantha also got me invites to watch some runway shows as well! And of course, I'll be going to the trade shows to see which clothes, shoes and accessories will hit the stores next spring/summer! Woohoo! Don't worry, I'll be sharing everything I discover soon! that is truly exciting!!! Can't wait to read about them in your next entries! i was browsing mindlessly through blogs and saw yours. really lovely. 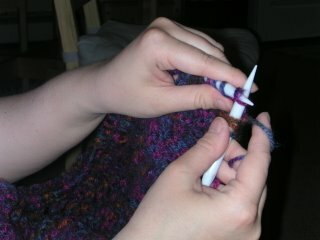 (: i added you to my blogroll! and the desserts are making me cry a little.. they're just so inviting! what a nice job MFO, i'd die for any fashion-related occupation! Heehee, if you think these macaroons look so tempting little ms dress up, in my dreams, there were more more more! 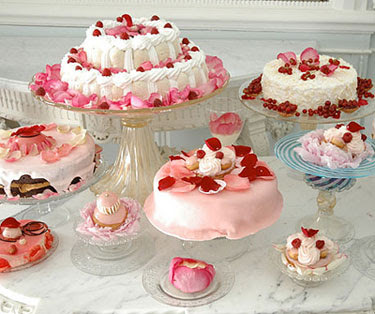 I was surrounded by such pretty pastries! If only I could draw what I dreamt, sigh! chico!!! I am so excited too!!! True vanessa, up to now I can't help but smile when I recall my dream of being surrounded by a shop full of Ladurée goodies! I'll make a post about your question anon! You'll love your French Soles promise! I definitely will post about it soon! Late August until September ruby! Thanks for adding me bestie! I'll add you too! By the way, I too have left you a little diamond gift on my Don't Be Losyang site. Thanks for the inpsiration Tin! 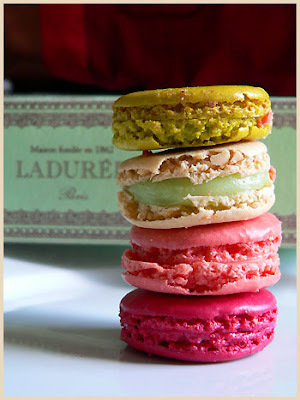 ooooh.... i'll be in paris next month and i'll make sure to taste some of those delicious ladurée macarons. Thanks Mieke! And yes, I was sort of wondering what that meant too! Heehee!